This Demonstration is intended to show how Rutherford, Marsden and Geiger managed to identify the presence of compact positive charges in atoms by interpreting the data from particles scattering from the nuclei in a thin foil. 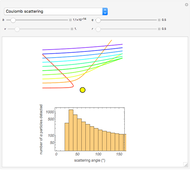 Select "single particle scattering" to show scattering by a positive charge. You can vary the impact parameter , the velocity of the particle and the charge of the nucleus. We ignore both the screening effect of electrons around the nucleus and the recoil of the much heavier nuclei in the metal foil. 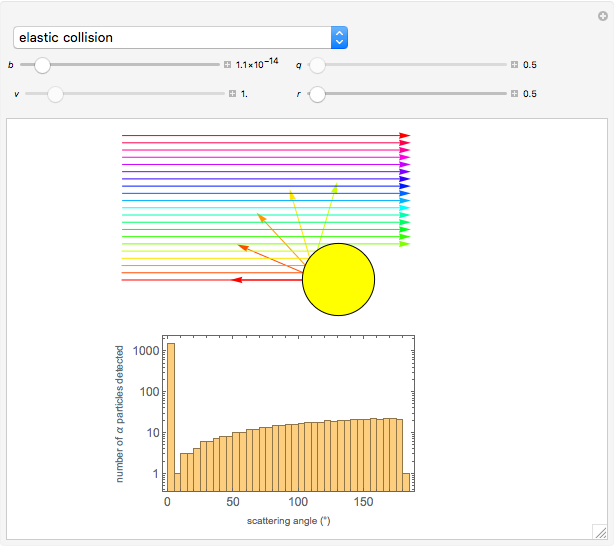 Select "elastic collision" to show what the scattering would be like if the nuclei were rigid spheres. In this case, the only relevant parameter is the nuclear radius . The results are shown as a histogram, plotting the number of deflected particles (on a logarithmic scale) versus the scattering angle (in degrees) . 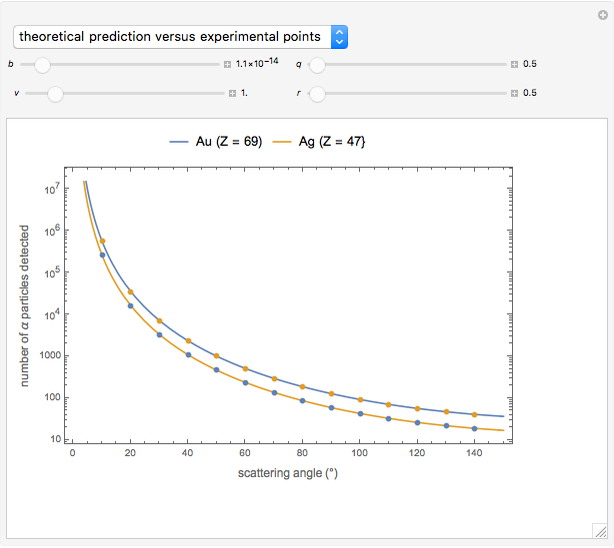 Some scattering trajectories are shown in the graphic at the top. 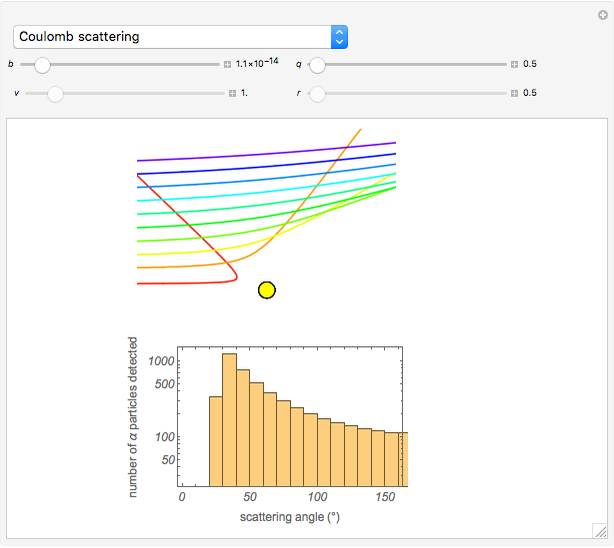 Select "Coulomb scattering" to show what the scattering would look like if the interaction with the nucleus were purely Coulombic. In this case, the relevant parameters are the initial velocity of the particles and the nuclear charge . An analogous histogram is shown , as well as some scattering trajectories . 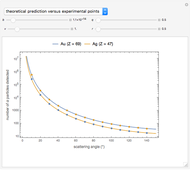 Select "theoretical prediction versus experimental points" to show a plot reproduced in many physics texts [1, 3, 5]: the theoretical curves calculated by Rutherford, as well as the experimental data of Geiger and Marsden. 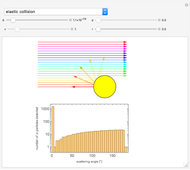 A comparison of the experimental data with the elastic collision and Coulomb scattering models can help with understanding the structure of the nucleus. R. A. Serway, C. J. Moses and C. A. Moyer, Modern Physics, 2nd ed., Fort Worth: Saunders College Publishers, 1997. R. I. Hulsizer. The Rutherford Atom [Video]. (Feb 15, 2017) www.youtube.com/watch?v=-DU9W9SsL_w&index=11&list=PLhAAV-jkgAdxUtFDMFlqZ-UwtgSWTz-i5. D. Halliday, R. Resnick and J. Walker, Fundamentals of Physics, 9th ed., Hoboken, NJ: John Wiley & Sons, 2011. M. S. Suzuki, "Rutherford Scattering and Hyperbola Orbit," ResearchGate, June 2016. www.researchgate.net/publication/303983573. E. Rutherford, J. Chadwick and C. D. Ellis, Radiations from Radioactive Substances, Cambridge, UK: Cambridge University Press, 1930. D. Meliga and S. Z. Lavagnino "Detailed Analysis of Rutherford Scattering of Alpha Particles"